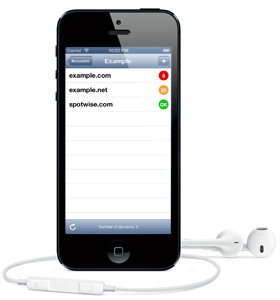 Domains is an iPhone application that can help you keep track of when it is time to renew your Internet domains. Domains can be arranged into different accounts, for instance to separate private domain registrations from those done for a company. Just add the domains you own and the application will check the registration information, including the expiration, from servers on the Internet. To check the status of the domains, just launch the application. The application will let you know if some domains will soon need to be renewed. By default it will warn two months in advance and alert two weeks before a domain expires. The application must be launched to update the warnings and alerts. Later updates will add push notifications. The application currently supports COM, ORG, NET, INFO, BIZ, CO.UK and SE domains. Please tweet me if you need more.